One late summer evening we had the chance to create a floral crown for one of our very favorite models! We also got to work with our favorite photographer, Mad Chicken Studio & one of the best make-up artists known to man, Derick Cich. Flower crowns, large or small, are a major trend that almost anyone can embrace. We were aimed for a bohemian feel that would perfectly capture a romantic and free spirited vibe. We even inspired a sweet passerby on horseback who let us borrow her horse for a few stunning shots! Check out Pete & Maria's perfectly executed November wedding. This winter wedding ceremony started off at Holy Rosary Catholic Church and the reception was hosted at the Greysolon Ballroom. The dark and sultry feel was highlighted perfectly by their bridesmaids' dresses and choice of traditional & unique floral. The floral consisted of hydrangea, black & white protea, sahara roses, black calla lilies, gilded succulents, seeded eucalyptus, and black dahlias. Oh so gorgeous! This day was exquisitely captured in all the ways by Three Irish Girls Photography. Need inspiration for your upcoming vows? take a look at more photos below! 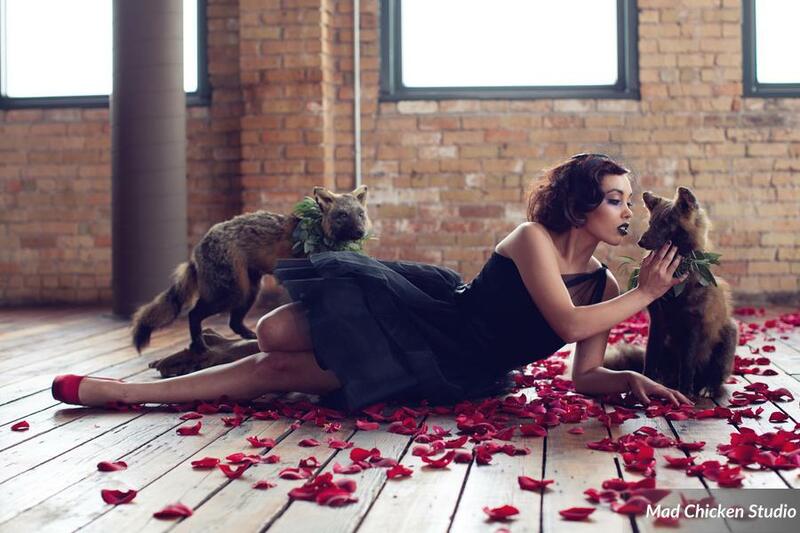 This delightfully dark styled shoot was perfectly captured by Mad Chicken Studio. The Clyde Iron Works venue helped capture the mysterious vibe that was further accented by deep purples, reds, and golds. Just check out that oh so sultry hair by Sarah Kringle at Vain Salon and makeup by Derick Cinch Makeup Artistry. We were swooning over the gorgeous decor and the floral consisting of eggplant ranunculus, blackberry privet, red heart roses, cymbidium orchids, and many curious varieties of tillandsia. The stationary by Tin Cup Design and cupcakes by The Buttercup Factory topped off the shoot to make it wonderfully romantic. Make sure to check out the original post at Bridal Beauty!